Horticultural crops are sources of vitamins, minerals and dietary fiber, but their cultivation is not widely practiced in developing countries, like Ethiopia due to small-scale farming systems and poor pre- and post-harvest handling techniques. In Ethiopia, particularly in northern region, the production of horticultural crops usually practiced in very few pocket areas, such as at river and lakesides. Thus, the production of fruits and vegetables is just at the beginning stage and getting momentum by governmental and non-governmental organizations. 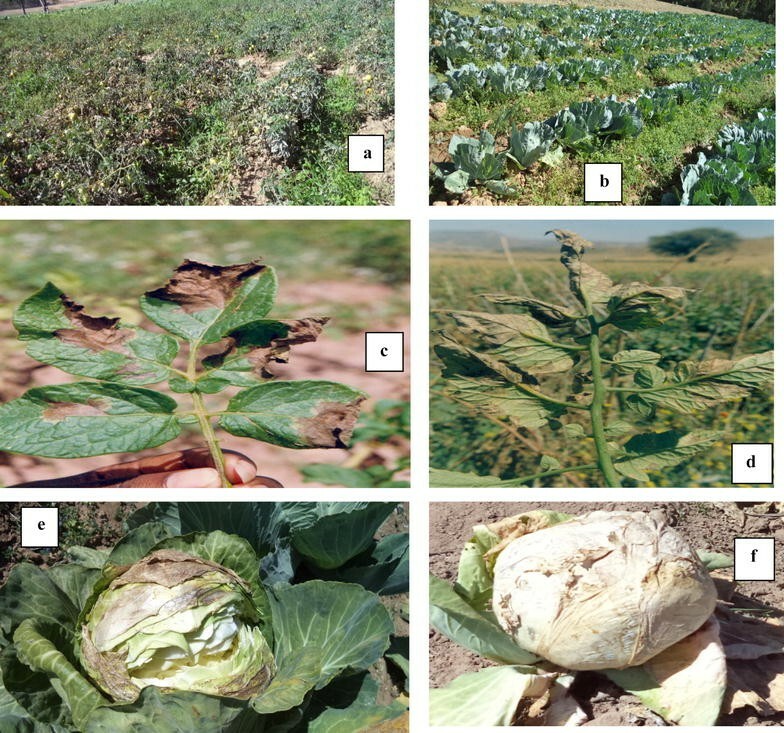 To assess the production potential and post-harvest losses of fruits and vegetables, a survey research was conducted in Tigray Regional State, northern Ethiopia. From the study area, Atsbiwenberta district was selected with its four purposely selected Kebeles (Kebelle is the lowest administrative division of Ethiopia next to districts in each administrative region) (Ruwafeleg, Felegewoni, Golgolnaele and Hayelom) in which 120 respondents (30 households from each Kebele) were participated. Data were collected from both primary and secondary data and analyzed using simple descriptive statistics like frequency, mean and percentage. From this survey research it was found that the region has the potential to produce both temperate and subtropical fruits and vegetable crops. However, their production potential was limited by different constraints starting from cultivation to consumption. Focus group discussion reveals that farmers obtained high production of potato and apple with average yield of 300–400 and 25–130 qt/ha, respectively. Conversely, post-harvest loss was significantly affected in the study area due to lack of awareness, market access, inadequate water supply and poor post-harvest handling practices. As a result, the loss of potato and other vegetable crops was ranged from 30 to 50 and 0.25 to 5 qt/ha, respectively. Therefore, designing further research projects is recommended on production and post-harvest handling of fruits and vegetables. In addition, all stakeholders should be designed market linkage and involvement of female farmers in production of horticultural crops. The production and marketing of horticultural crops constitutes a major source of cash income for the households and an opportunity to increase smallholder farmers’ participation in the market. More than 85% of Ethiopians in rural areas rely on agricultural production for their sustainable livelihood ; thus, the Ministry of Agriculture and Rural Development (MOARD) focuses on market-led agricultural development and the government pledges support to market integration and agro-enterprise development. However, horticultural crop production in northern Ethiopia faces many challenges even though farmers have willingness to increase the production and productivity of the crops. Because they are needed to produce potential fruits and vegetables for marketing and consumption, i.e., they have a comparative advantage to generate income as compared to cereals, and specially vegetables require shorter time for production, yield more and generate higher income and the market outlet. Though there is enough labor available to increase horticultural production, there are other factors of production and marketing functions constitute serious challenges to promote horticultural crops in small-scale farming communities. Hence, farmers rely only on traditional production skills and methods  to produce horticultural crops in their small sort of lands. Ethiopia’s Ministry of Agriculture is striving to minimize post-harvest losses, which is causing up to 20–40% losses in sub-Saharan Africa  and 20–30% production loss even as the country’s grain output continues to increase. The post-harvest losses of perishable (vegetable and fruits) food crops amounted to be about 30%  due to the presence of high moisture content (65–95%), insect infestation and damage during post-harvest handling techniques (packaging, storage and transportation). However, use of appropriate packaging materials, proper storage facilities and transportation can help to minimize these losses. In addition to this, modern food processing techniques and post-harvest technologies are the main tools to reduce perishable food losses and maintain the quality of products . On the other hand, generating efficient, low-cost and indigenous technology minimizes post-harvest loss of fruits and vegetables as the largest groups of people in Ethiopia who suffer from food and nutrition insecurity are the rural poor who have insufficient land and lack of resources to provide sufficient income generation through production of fruits and vegetables with integrated post-harvest technology [6, 7]. According to Panhwar , it was reported that farmers sometimes do not even get the two-way transportation cost (cost to transport), so they would rather leave their produce near the market area than bearing the transportation cost required for taking the produce back. However, improving post-harvest management practices will be reduced post-harvest losses, and hence, production of value-added products with effective and efficient research programs should be strengthened and promoted in developing countries [5, 9]. In the country level, a number of research works have been done on horticultural crops, but little or no more research was done on the production potential and post-harvest losses of horticultural crops in northern part of Ethiopia, particularly in Tigray Region. Atsebiwonberta district is one of the districts of Tigray that has been introduced few intensive interventions and successfully applied in the value chains of fruit and vegetable crops. However, individual farmers have limited skill and knowledge on modern cultivation systems and post-harvest handling practices to increase production and post-harvest losses of fruits and vegetables. Therefore, the objective of this research was to assess the production potential and post-harvest losses of fruits and vegetables at Atsbiwemberta district farmer’s field and to identify the technological gaps in the existing production and post-harvest handling techniques. Atsbiwenberta district is located in eastern zone of Tigray Regional State, northern of Ethiopia. This study was carried out in the highland and lowland areas of the district (Fig. 1). The district is located at 13°52′N and 39°44′E, about 65 km far from Mekelle, Capital city of Tigray Regional State, and shares a border with Afar Regional State to the east, Wukro to the west, Enderta to the south and Saesie Tsaedaemba district to the north. In addition, the district has an altitude between 2300 and 3200 m above sea level with mild temperatures and a mean annual rainfall ranging from 400 to 600 mm . In this survey research, both primary and secondary data were collected. The primary data were obtained from farmer’s field visit, group discussion, through interviewing farmers, development agents and Bureau of Agriculture and Rural Development (BoARD). Whereas the secondary data were collected from relevant documents of regional bureaus, zonal agricultural offices, districts agricultural and rural development offices, available literature reviews and internet web pages were also searched to consolidate the research findings. Prior to the main sampling attempted, there was an informal survey discussion with the agricultural extension staff especially, horticulture experts and development agents. The elders and those who have better experience in cultivation of horticultural crops were participated in the discussion which helped to identify potential areas where horticultural crop production widely practiced. At this stage, the objective and scope of the study was explained briefly to the selected informal discussion group. Based on the understanding and agreement with these officials, community elder and leaders, the real survey was identified. Four representative Kebeles (Ruwafeleg, Felegewoni, Golgolnaele and Hayelom) of the district were selected by purposive sampling technique where horticultural crop production is dominantly practiced. A total of 120 households in the district (30 households from each Kebele) were selected based on their involvement in fruits, vegetables and root and tuber crops production to address the objective. The questionnaire was mainly focused on vegetables and fruits production, pre-harvest cautions, post-harvest losses at different stages of handling and production constraints of the crops. The data were collected through semi-structured questionnaires (cross-sectional survey), focus group discussion (FGD) and field observation on farmers’ cultivation site via formal and informal survey. The questionnaires were pretested and then translated into the local language “Tigrigna” in order to help understand the questions easily. The collected data were analyzed using simple descriptive statistics like frequency, mean and percentage using SPSS (version 20.0) package software, and data were coded for analysis. Descriptive statistics was used to describe quantitative factors. Frequencies and percentages were used for describing qualitative characteristics. The data were analyzed using one-way analysis of variance (one-way ANOVA) at significance difference p < 0.05 level. Among 120 sample respondents, 92 were males and the remaining 28 were females. Result showed that males involved much more in fruit and vegetable production than female farmers. With regard to age groups of fruit and vegetable producers, 47 respondents were ranged from 31 to 40 years old followed by 36 respondents grouped to ≥ 51 years old and lastly about 30 respondents were ranged their age group from 41 to 50 years old. The level of education was also varying among the respondents in which the majority of them (67) were illiterates, and the rest 41 and 12 of the respondents attended grade 1–6 and grade 7–12, respectively. Most of the respondents were married (101) followed by divorce (14), widowed (3) and unmarried (1). Majority of the respondents (79.4%) have access to market in nearest area to sell their produce, followed by 12.4% of the respondents who have intermediate access to market. However, 8.2% of them travel more than 31 km far away from their home to the market area as shown in Table 1. Socio-demographic characteristics of fruit and vegetable producers. The income generation of sample respondents was mainly focused on cereal crops (36.7%) followed by horticultural crops, particularly fruits and vegetables (28.3%), and 16% of them were generated their income from both cereals and horticultural crops. On the other hand, respondents that have both fruit and vegetable production with grain and pulses production were obtained 16%. In the study area, apple and potato were observed as a significant income generating crops compared to other crops. That is farmers earned an average income of 65.22 USD from seedlings and 565.22 USD from selling apple fruits per cycle. In addition to this, individual potato producers also earned an average income of 869.57 USD per production cycle. The farming system in both highland and mid-lowland of the study areas is mixed farming, and farmers are own very small farmland; thus, they keep rearing animals in their homestead and provide feed by cut and carry system. In addition, farmers produced different crop varieties and horticultural crops during rainfed season and/or by irrigation in order to sustain their family food supply and to cover various household expenses. This study showed that farmers are cultivated mostly potato, local cabbage, apple, tomato, onion, garlic, Swiss chard, chili and lettuce together with cereals and pulses within the year life time. According to the respondents’ preference, fruit and vegetable crops are mostly produced by irrigation. Hence, about 51% of respondents cultivate mostly vegetables followed by 32% of them cultivate mostly fruits and rarely vegetables. In addition to this, 13% of the respondents are cultivated mostly vegetables and rare fruits, whereas 4% of the respondents are produced mostly fruits as compared to vegetables (Table 2). Frequency and percentage of fruit and vegetable crops production of the respondents in the study area. Due to arid and semiarid agroecology with small-scale farming system and erratic rainfall of the region, most of the arable land of the study area is fragmented and prone to drought. Thus, there were a major production constraint on fruit and vegetable crops production and losses as it is presented in Table 3. The result reveals that there was shortage of improved cultivars of fruits and vegetable seeds supply in the study area, since there was no governmental or non-governmental organization responsible for the multiplication and distribution of horticultural crop seeds specially fruits and vegetables. Consequently, farmers are restricted to use local horticultural crop seeds with lower productivity and prone to most of the diseases and insects (Fig. 2). Nevertheless, nowadays, for instance, projects like International Center for Potato (CIP), the shortage of quality potato seed supply is solved by half except the problem of post-harvest losses and market access of the crop. Production potential, price cost of the produce and post-harvest losses of fruits and vegetables in Atsebiwonberta district with respective to each Keble’s. a Poor cultural practices, b weeds invaded cabbage, c and d late blight (Phytophthora infestance) in potato and tomato leaf, e head splitting due to improper water irrigation, f tip burn due to nutrient deficiency (Ca) in cabbage. Cultural practices are the basic management practices help to prolong shelf life of perishable horticultural crops. For example, as it was stated by Kader and Rolle  and Kamrul  pre-harvest techniques such as pruning and thinning increase the fruit size and decrease TSS and acidity of fruits. From the study, it was found that irregular irrigation before and after harvesting decreases the shelf life and sensory quality of fruits and vegetables which is similar with findings of Shimilis  and Mulatu . Likewise, other serious problems were also identified from respondents’ field due to the presence of nutrient deficiency, diseases and pests on the critical time besides to their poor cultural practices (Fig. 2). This was affected on potato tuber, cabbage heading, tomato fruit size and shape, and immature fruit drop in apple and citrus fruits. Out of the sample respondents, 44.17% of them were cultivating fruits and vegetables manually and 36.67% of them were used integrated pest management (IPM) practices to control pets. However, 19.17% of the sample respondents are used different pesticides. This indicates that some horticultural crop producers are not practiced well in organic farming system rather they cultivated on inorganic farming which is not necessary for environmental protection and soil microorganisms. Meanwhile, the time of cropping cycle of fruits and vegetables differs with cultivars, type of edible parts and market access. About 93.3% of the interviewed respondents cultivated and harvested two times in a year with the help of irrigation in the winter season. Even though a lot of challenges and constraints were affected the cultivation and production potential of the crops in the study area, it has the ability to produce apple (130 qt/ha), potato (300 qt/ha), tomato (240 qt/ha), onion (200 qt/ha) and garlic (230–240 qt/ha). However, there was an annual loss per individual crop (Table 3) of the produce due to market problem and poor post-harvest management practices. For instance, the loss of potato was ranged from 5 to 35 quintal per annum. In addition, lack of disease and pests control methods, post-harvest management practices and lack of demand in the market were the main constraints of potato production in the region, specifically in the study area. Moreover, very few of the respondents said (data not shown) that there was no a serious problem during their cultivation of produces, except wilting in leafy vegetables, because they were produced low yield and loss was not much more happened. From the study, it was also observed that there were poor cultural practices in the farmers’ backyard site (Fig. 2). Meanwhile, respondents have their own preferences to know the critical physiological maturity and ripening period of fruit and vegetable that is the crucial art of the producers . So that most respondents were decided to harvest fruits by looking and take sampling judgments such as color, size and shape, touch–texture, hardness or softness, smell–odor/aroma and taste–sweetness, sourness and bitterness. On the other hand, vegetable growers were also harvested over a wide range of maturity stages when they attained physiological maturity and but still tender depending upon the part of the plant used as food as it was cited by Rural Agricultural Development Authority (RADA) [13, 14] which was also used by the fruit and vegetable growers in the study area. In addition, 99% of the respondents are identified and known their fruit and vegetable maturity harvest by visual, smelling, testing, feeling, eating or nutritional quality and harvest their produce by using either hand or supporting equipment’s for home consumption as well as for marketing which was also applicable in other horticultural crop growers as cited by Arah et al. .
Generally, farmers have their own preferences on how to, when and what type of crops to be cultivated for better yield enhancement by using local cultivars in their small farmlands. In contrast, there are knowledge gaps and challenges along with production, harvesting, storage, transportation and marketing of the produces. As it was obtained from the research, the cultivation and production potential of fruits and vegetables were constrained by different factors such as lack of improved cultivars/seeds, lack of market access, lack of post-harvest managements, lack of equipment’s and materials, shortage of insect and pest control, lack of irrigable land (i.e., some producers use temporarily rent farmlands which is not enhanced to grow permanent fruit crops) and problem of late sowing due to erratic rainfall. Indeed, there were also other production constraints in some fruits and vegetables such as fruit ball worm in guava, rust disease and pests in lettuce and immature fruit drop in apple (i.e., decreased the quality and shelf life of the crops, and hence, their prices become low). Pre-harvest factors or activities could affect the post-harvest shelf life and qualities of perishable horticultural crops . Hence, pre-harvest cautions are very important for longevity and quality maintenance of fruits and vegetables . But, results showed that 66 of the respondents were not using pre-harvest cautions to protect their horticultural crops after harvest, whereas 54 of the respondents were using different traditional cultural practices, starting from selection of appropriate season to harvesting time. Moreover, most of the producers were also vulnerable to exhaust their cost of production due to different challenges such as lack of appropriate and well-advanced cultural practices, lack of market demand and market link accesses and lack of post-harvest storage conditions (except few farmers were organized in association) and they were benefited from seed production and multiplication of potato and some cereal crops as shown in Fig. 3b. Potato storage room prepared from local available materials in Tabia Felegewoni; HH—households. a (an individual HH potato storage room). b (Local seed businesses (LSBs) in Shewit Association). On the other side, producers minimize their cost of production through prior production of nursery seedlings and selection of appropriate harvesting time on some fruit crops. For example, apple producers were obtained an average income of 652 USD per annum from both seedlings and fruit sell. In deeded, they were protected fruit loss by covering local plastic materials, but there was the problem of fungal formation in the external fruit part. Another pre-harvest caution practiced in the study area was removing of diseased standing plants from the plant population (especially for late and early blight of potato and tomato, bacterial wilt of potato), harvesting of fruits before full ripening (i.e., tomato) was also the most practiced activities. In the study area, respondents were used pre- and PHM practices supported and established by the CIP project specially for potato and some cereal crops (mainly barley and wheat), that is, in Shewit, Kaly Chema and Habes, and it was focused on production and multiplication of local quality seed in association (both in the field and out of the field) to control pre- and post-harvest losses and to access quality seed supply to the region, specifically to the district: for example, preparation of local aerated storage rooms (Fig. 3), separation and grading of potato tuber, harvesting of vegetables early morning or late evening were practiced for marketing, seed multiplication and consumption purposes. According to Kitinoja and Kader , there are some fruits that had low relative perishability like apple which has a potential storage life of 8–16 weeks, but the research showed that there were losses due to lack of knowledge on post-harvest management, rodents and market access. In the contrary, some respondents in the district said that they did not take any pre-harvest cautions, but they cultivate as they want by using traditional cultural techniques. It is clear that there is lack of awareness, skill and knowledge in the producers’ perception. There are several harvesting methods on fruit and vegetable depending on the technology advance, but in the study area, respondents harvested by using hand (74.1%), supporting equipment (22.5%) and by using both hand and supporting equipment (3.3%). This study reveals harvesting using hand had very high (58.3%) market value as compared to using supporting equipment’s in the study areas. Respondents also collected the produce, stored and/or covered in temporarily local packaging materials to protect from wilting and contamination before submitted to the traders and end users immediately after harvesting. Besides to this, harvesting at the critical ripening period, collect the yield and pack using local packaging materials (basket, zembil) was their day-to-day activity of the potential producers in the study area. Pre-harvest before ripening to control over ripening in some vegetables also practiced in tomato to protect from perishability and to increase its shelf life. Harvesting practices should cause a little mechanical damage to produce as possible. Gentle digging, picking and handling will help reduce crop losses as cited by Kader  and chilling leafy vegetables by using cold water at harvest will help to maintain quality and prevent wilting . In addition to this, use of suitable harvesting containers like buckets not baskets, since they do not collapse and squeeze the produce harvesting containers like buckets not baskets, since they do not collapse and squeeze the produce, but all of the above harvesting techniques as well as use of appropriate harvesting materials was not still properly applied in the study area (Table 4). However, when the attitude of the respondents was surveyed, it was found that inefficient that is improper handling systems contributing 48.4% of the existing post-harvest losses for fruits and vegetables. Improper handling of fruits and vegetables during transportation and marketing in the study area. Have you ever received muddy and dusty fruits from the producer? Have you ever received muddy and dusty vegetables from the producer? Have you ever received physically injured fruits from the producer? Have you ever received physically injured vegetables from the producer? Have you ever received both spoiled and healthy fruits in the same container from the producer? Have you ever received both spoiled and healthy vegetables in the same container from the producer? Have you ever received fruits and vegetables in packed form? As shown in Table 4, improper handling of fruit and vegetable during harvesting, packaging and transportation was a serious problem to the producers as well as to the traders, that is, 34% of the respondents were responded that there is a muddy and dust, physically injured and mixing of spoiled with healthy fruits (Fig. 4a, b) and vegetables during packaging (Fig. 4c–f), whereas 41.23% of the respondents were responded that there was the problem of transportation from the field to the market nearby area. 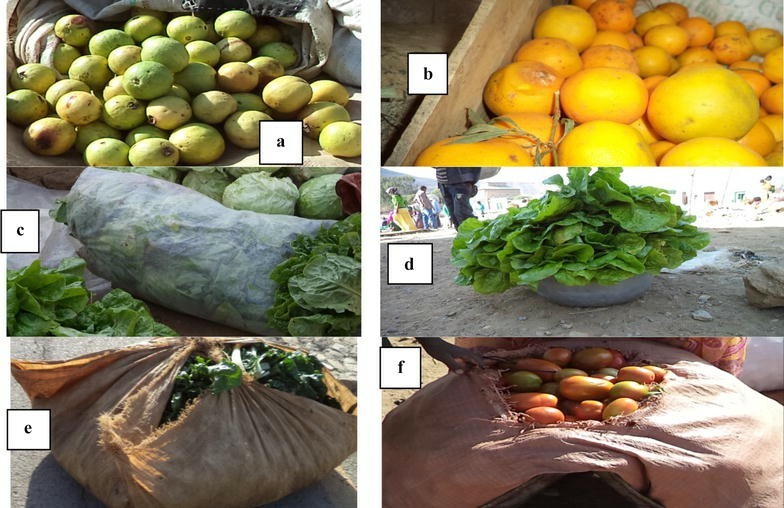 The top a and b: mixing of spoiled fruits with healthy ones; c–f: different packaging materials used for leafy vegetables in Haykimeshal market area (Kebele Hayelom). In Atsbiwonberta district, post-harvest handling was beginning to potato and some cereal crops, but it is not practically distributed to other perishable horticultural crops which has been affected the shelf life and quality of the produce. For example, according to the district annual report about 36% of vegetables decay due to soft-rot bacteria, but the losses can be minimized by proper pre- and post-harvest treatments (pre-harvest application of Maleic hydrazide reduces sprouting of onions and potatoes during storage, and N-benzyladenine, i.e., prolongs shelf life of leafy vegetables)  but not still applicable in the study area. As shown in Table 5, 29.8% of the producers were lost their produce due to marketing problems (lack of demand and sanitation) which is followed by injury and infection 18.5% of the yield loss during harvesting, transportation and marketing which is similar to findings of Kitinoja and Kader [8, 20] in developing countries ranges about 20–40% losses, but improper harvesting was the least (15%) loss of fruits and vegetables. Major causes of post-harvest loss of fruits and vegetables in the district. Fruit and vegetable producers as well as traders in Atsbiwonberta district were maintained their produce shelf life and quality before marketing by using local storage rooms, sacks and nets, polyethylene bags, carts, carton, local storage materials like baskets, but they were stored them in an unclean area. One of the harvesting methods commonly practiced in the study area was harvesting manually, in which the commodity protects from mechanical damaging and excess moisture loss, but it is tedious to the workers. In addition, leafy vegetables were maintained in an exposed area, but they were traveled it early in the morning; moreover, there was no permanent cool area for selling to protect from excess moisture loss in some marketing areas of the district. Even though insignificant respondents had established market linkage with whole sellers before they harvest their produce, there was loss of fruits and vegetables without consumption due to shortage of storage rooms, diseases and pests attack and local market access. For example, 30–50 quintal of potato was lost in 2014, which is still the problem of potato producer perceptions, because predominantly there was lack of local market access. On the other hand, there was low yield of vegetable production due to shortage of water supply during the growing period. Thus, as a remedy, it is important to improve post-harvest management practices with aim to reduce post-harvest losses, production of value-added products, effective and efficient research programs to strengthen and promote fruits and vegetables as it was discussed in EARO  and Azizah et al. in the study area. During transportation and marketing, fruits and vegetables desired packaging materials and transporters; as a result, producers sell their produces in their nearby market. Leafy vegetables such as cabbage, lettuce, spinach and Swiss chard were packed by local accessory materials (basket, plastic materials and nets), and fruits, root and tuber crops were also packed by using local sacks, wooden boxes, polyethylene bags and other packaging materials. The survey result showed that 46.6% of the respondents used packaging accessory materials, while they transported from the field to the marketing area, whereas the remaining 26.7% of the respondents were not using packaging materials. On the other hand, there was no much lost in some fruits such as apple and fresh maize corn due to its high market demand and resistant to perishability. Currently, the production of fruit and vegetable is very low due to improper management practices before and after harvest. But there were few model farmers trained on how to produce and manage their crops and applied their experience for better cultivation and prefer to sell immediately especially for vegetable crops unless they used it for feeding animals and preparation of compost. As shown in Table 6, about 47 of the respondents were transported their produce to the market by equine followed by human back and equine (41), whereas very few farmers were used vehicles (20) as mode of transportation if their production is high. From the FGD, participants were identified the main constraints on horticultural crop production potential and post-harvest management practices in the study area. The discussion was focused on cultural practices, water availability, harvesting techniques, post-harvest losses and management, storage rooms and market accessibilities. As they were told that there was a high yield production of potato in 2012–2014, but it was loss due to lack of available storage houses, market access and linkage. This indicates that there was a high post-harvest loss and many producers lost their produce near around their field as shown in Fig. 5. Therefore, it is needed to practice and prepare PHM techniques in their locality with clear practical support for easy identification of the basic pre- and post-harvest management practices. This was also used to sustainable the production system of fruits and vegetables. In addition, participants said that the main reasons for loss of horticultural crops were water scarcity, lack of improved resistant varieties to shelf life and diseases and pests as compared to cereal crops. But they concluded that the production of horticultural crops has threefold economic benefits to individual households as compared to cereal crops. Improper PHM of fruit left side (orange) and vegetable (tomato) right side brought loss of the produce. From the FGD, it can be concluded that fruits and vegetables have the potential to change health and economic status of poor societies than cereal crops because they can be grow in marginal lands with low production cost in a sustainable way of production system. Indeed, they have a great role in socioeconomic aspects of the community so as to promote gender mainstreaming in production and expansion of horticultural crops that is better when the agriculture sector supports to them on technical knowledge, water harvesting techniques and market linkage facilities. Besides to this, it is needed to create job opportunities (i.e., entrepreneurial skills), and focusing on sustainable income instead of short-term incomes was also a reason for promoting horticultural crops in region. Fruits and vegetables are the main sources of vitamins, minerals and dietary fiber in human diet. In Ethiopia, production of horticultural crops is in its infant stage particularly in Tigray region, which has the potential to produce fruits and vegetables. However, due to different social, agroecological, and economical constraints, it is not well adapted and distributed the cultivation of fruits and vegetables. Previously in the region, the production of fruits and vegetables was cultivated in some very small pocket areas near to rivers and lakesides for local consumption in rare societies. But recently, the production of horticultural crops becomes a small-scale farmer’s business sector. It is just at the beginning stage and getting momentum from governmental and non-governmental organizations, especially in irrigated areas. Pre- and PHM practices are essential for fruits and vegetables to supply a quality yield to the market. However, there was a great deal on post-harvest loss of potato (reaches up to 50 quintal/production cycle), in the study area mainly due to lack of market access and linkage and lack of awareness, and it which was mostly happed on small group of producers in association with local seed production and multiplication of potato. Indeed, this was regressive that other individual stakeholders not to produce fruits and vegetables for long-term return. Generally, it could be concluding that horticulture crop producers in northern part of Ethiopia, particularly in Tigray region, are used different cultural practices adopted from innovative technologies and their own tradition cultural practice, and hence they had been increasing the potential for production of fruits and vegetables. However, there are many production constraints during cultivation, harvesting, transportation, marketing and consumption of fruits and vegetables, and hence post-harvest loss was listed as a main challenge to perishable crop producers in the study area. Therefore, designing further research on innovative technologies for access supply and consumption of horticultural crops should be required because they are more cash crops than other crops are used. In addition, capacity building on post-harvest handling techniques of fruits and vegetables should be promoted. Likewise, all stakeholders (both governmental and NGOs) should work in collaboration to facilitate a sustainable production of fruits and vegetables in small-scale farmers with a long-term market access. Besides to this, involvement and participation of female headed households on production of horticultural crops should be practiced to create awareness and sustain the livelihood of the community. Conception and design of the research proposal, collection of data, data import to excel, analysis and interpretation of data by using SPSS software version 20.0. Authors also work on writing the manuscript article, revising it critically for intellectual content and final approval of the version to be published. Finally, before submission for publication, all authors are read and approved the final manuscript. We would like to give our sincere appreciation to Mekelle University, Institute of Environment, Gender and Development Studies (IEGDS) for its financial support. Our sincere gratitude also goes to Atsbiwonberta district administrator and Development Agents (DAs) immeasurable collaborated us on selecting the sample respondents and giving on secondary data sources. Finally, but not the last our great sincere also goes to appreciate farmers/respondents for their contribution on integrity and honesty in answering the questionnaire and taken focus group discussions. It is possible to access the data on personnel request from the principal investigator. Consent was taken from the purposively selected district through participants as it would be disseminated to the concerned using different means. The study was undertaken after the approval of the university research and publication team, ethical review committee of Mekelle University, Institute of Environment, Gender and Development Studies (IEGDS). Official letter was written from the institute with the detailed explanation of the purpose and importance of the study to Tigray Bureau of Agriculture and distributed it to the selected study areas. The purpose of the study was explained to each study area, and participant informed verbal consent was obtained from all study subjects before conducting the actual interview and discussions. For this purpose, a consent form was attached to each questionnaire which explained about the purpose and importance of the study, confidentiality and the respondent’s full right to answer the questions or not before the beginning or at any time of the study. Each interview was conducted after informed verbal consent was secured. All the collected data are kept in safe custody by the responsibility of the primary investigator. This study was financially supported by Mekelle University, Institute of Environment, Gender and Development Studies (IEGDS). Panhwar F. Post-harvest technology of fruits and vegetables, 2006. www.eco-web.com/editorial/060529.html. Accessed 25 May 2016. TLZR (Tigray Livelihood Zone Reports pdf) Atsbi Wonberta Highland Livelihood Zone, 2006. http://www.dppc.gov.et/Livelihoods/Tigray/Downloadable/Tigray%20Woreda%20Reports/Atsbi%20Wenberta.pdf. TLP (Tigray Livelihood Profile). Draft Atsbi Wonberta Highland Livelihood Zone, 2006. www.heawebsite.org/download/file/fid/359. Accessed 27 Mar 2018. RADA (Rural Agricultural Development Authority). RADA DIARIES: Post-harvest management of fresh produce; 2015. www.rada.gov.jm. Accessed 18 Apr 2015.